Meet Erin Brady! She’s in my Herb Garden now, stripping leaves off the “loot” she collected. I noticed she kept stems quite long, and only shortened them as necessary during arranging-time. 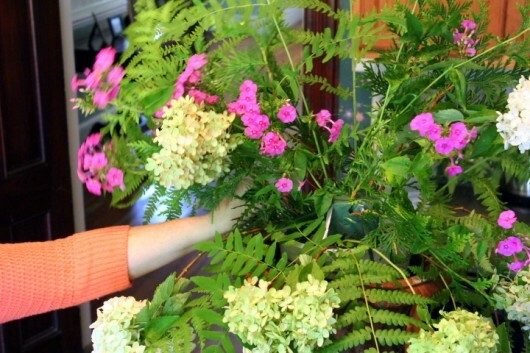 Tip: To get the longest vase-life out of garden flowers, cut them early in the morning. Then immediately plunge the stems into water. First, select a vase! It should be tall and fairly wide. 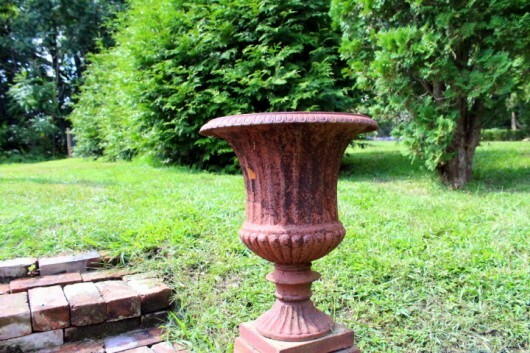 I used the cast-iron urn that has been standing — empty — in my garden for many years. The urn seemed grateful to finally have a purpose in life. Unfortunately, the urn had an open bottom, and thus would not hold water. To be useful for flowers, it would need a liner of some kind. It also weighed a ton. You should have heard poor Erin groan as she carried it down the hill, and into my kitchen. Probably I should have offered to help. Okay, I carried the urn down the hill and into the kitchen. Groaning all the while. As you can see, a plastic tub solved the hollow-bottom problem. You can find such tubs in the paint department at any hardware store. Next, stuff your container with (thoroughly soaked) blocks of Oasis. Oasis is a water-absorbing foam. Erin placed one Oasis block in the center of the tub, and then wedged it in place with two smaller blocks. 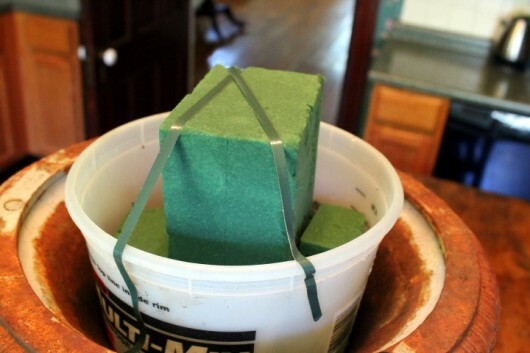 As illustrated above, secure the Oasis to your container (and to your tub, if you are using one), with florist tape. You can find both Oasis and florist tape at craft stores. Or, you can order them from Amazon. It’s arranging-time, baby! 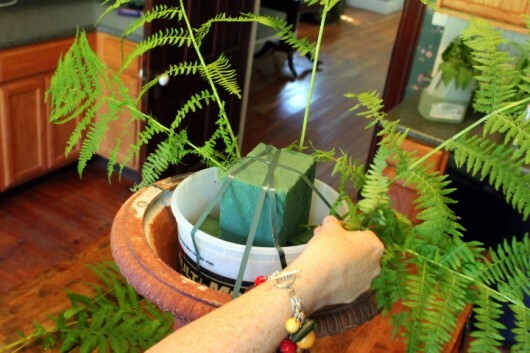 Grab some lacy-leaved ferns, and plunge them along 3 sides of the Oasis block. 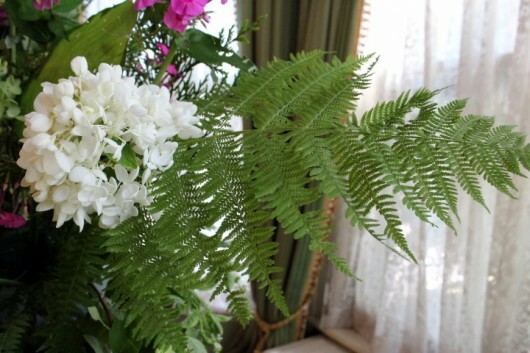 Erin used several stems of “New York” and “Royal” ferns she found in my Woodland Garden. 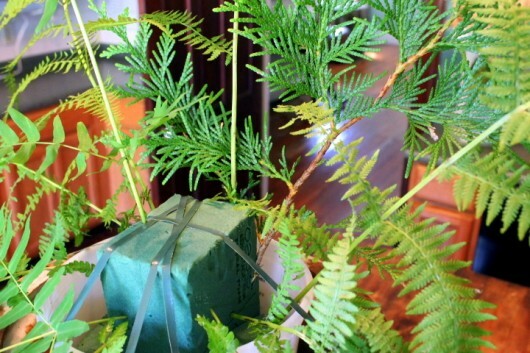 Then stick boughs of cedar or arborvitae between the ferns, and along the sides and back of the block. The boughs pictured above are Thuja ‘Green Giant’ — my favorite shrub for making neighbors disappear. Next, insert some green and white hydrangeas. 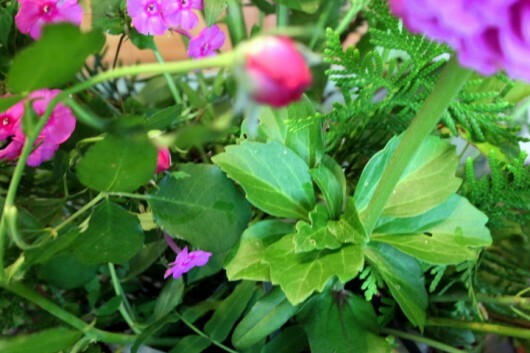 Use long stems for a puddling (or “drooping”) effect at the front and sides of the arrangement. 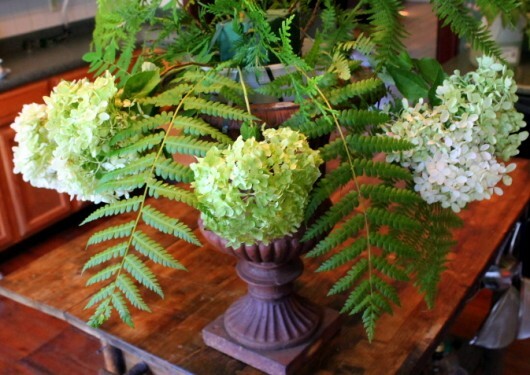 Shorten the stems to make some of the hydrangeas stand up. Then add some phlox. 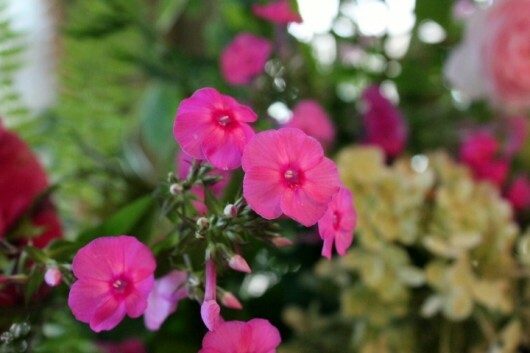 Erin used long stems of a purple-pink variety that grows beneath my kitchen windows. And what would a summer display be without zinnias? 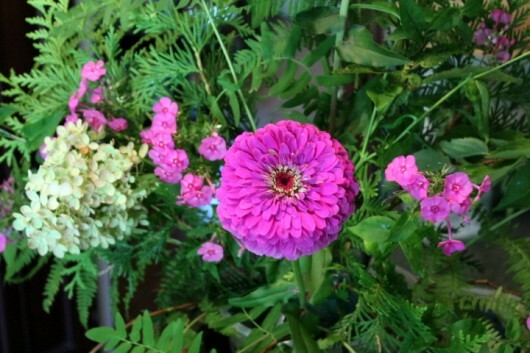 Erin peppered the arrangement with the ‘Royal Purple’ heirloom zinnias that grow in my Kitchen Garden. 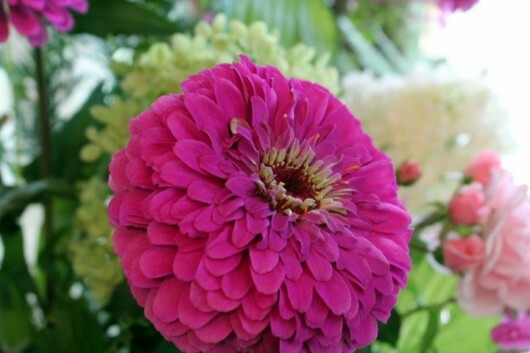 Tip: With zinnias and other hollow-stemmed flowers, be sure to cut the stems with a sharp knife. Scissors will only pinch the stems, and hinder their ability to take up water. 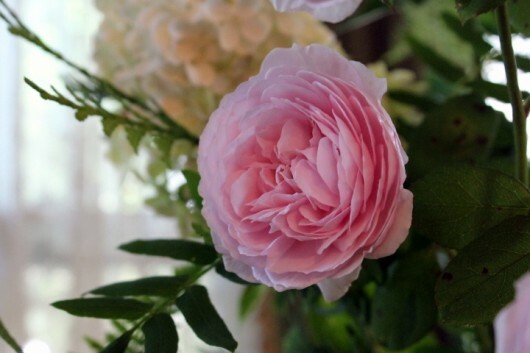 For intoxicating fragrance, add sprays of shrub roses, such as the (intoxicating) pink ‘Gertrude Jekyll’ pictured above. Should any bits of Oasis be visible, conceal them with Pachysandra. And finally, for a bit of whimsy, tuck colorful hosta leaves along the edge of the arrangement. Erin placed one leaf on the left side, and two on the right. Now transfer the composition to a prominent position that is out of direct sun. Be sure to fill the container with water at this time. A few drops of bleach will keep the water sweet. And colorful hosta leaves, which, if you look carefully, have been chewed by slugs. Was this feature helpful to you in some teeny-tiny way? Perhaps you can let me know by leaving a comment. As always, I love to hear from you. 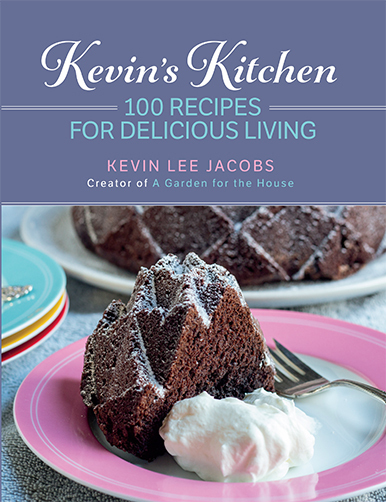 Don’t miss anything at A Garden for the House…sign up for Kevin’s weekly updates. Wow, you guys make it look easy once it is broken into steps. I do it all wrong! Thanks. What a great tutorial! I never thought about hosta leaves or arbovitae stems in an arrangement. love the flower arrangement. 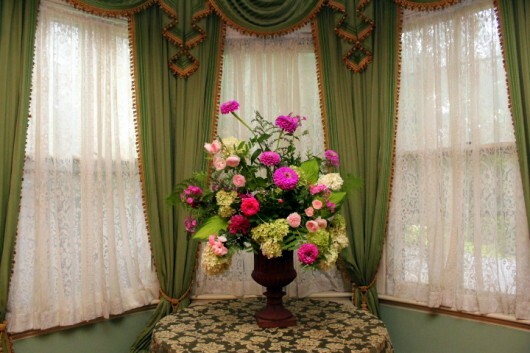 being a curtain maker, sure would love to see more of the beautiful treatments behind the flowers ! took a look at previous posts on the house, found pics of your beautiful window hangings.! Gloria & Badger – It was fun to photograph the steps — so glad you found them helpful. Sue – I was going to link to the house tour articles. Glad you found them! 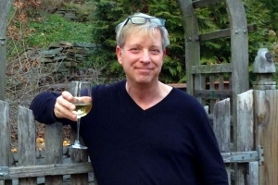 Love your posts…they always inspire me…Thanks so much for sharing. Just beautiful. Elegant. So nice to see just plants from the garden. No feathers or strange tropical unknown things!!! This is so awesome. I really need to take a flower-arranging class. — my MO now is: Cut a bunch of bushy marigolds, strip off the lower leaves, stuff them all in a pretty picture. There is a certain wild charm, but it’s definitely not flower arranging! 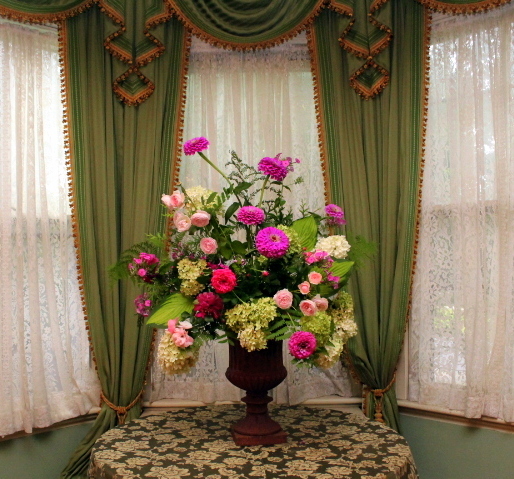 The arrangement and the curtains are beautiful. So gorgeous! You always post such inspiring but still “do-able” ideas Kevin! Thank you so much! Tomorrow morning I’m going to go out to cut some flowers and see what I can come up with! 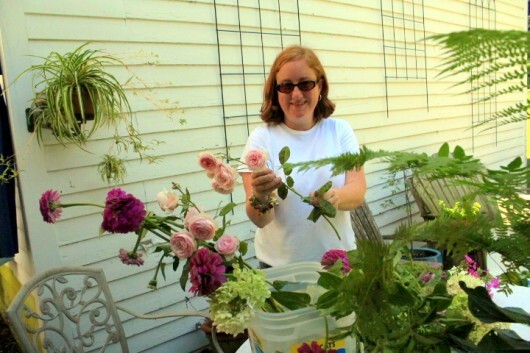 I had a blast arranging your beautiful garden flowers! Your gardens are so amazing! 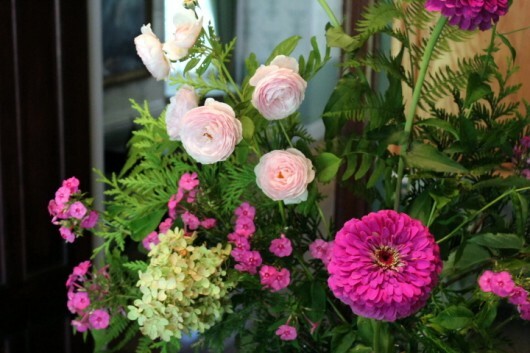 I hope all who reads tries floral and fauna arranging this weekend. It just brings a bit of sunshine indoors. Erin – Amazing. The 3 arrangements are still holding up! Absolutely beautiful! Love the colors in the arrangement, fantastic! Love how the flowers look in your beautiful home! Excellent photo essay again, your trademark. I have used Hosta leaves in arrangements in the past to wild acclaim. I have to catch them early enough in the season that weed whacker or slugs have not made their indelible mark yet. 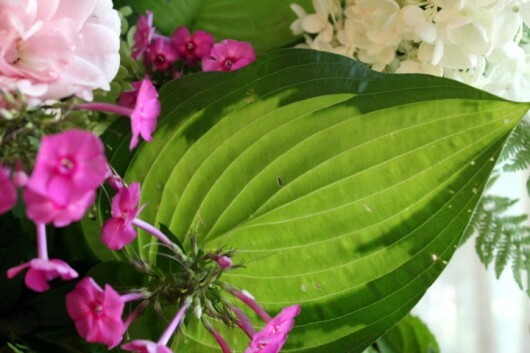 Bigger Hosta leaves are most useful in hiding the seam between the bottom of the bouquet and the vessel. The hard part is finding ones with a naturally curved stalk that will drape over just so. Is the name of your Hosta available ? Or are you like me, with a large, much loved, but nameless collection? Your photo of the finished product is eye-popping. You must miss your classy surroundings terribly when you go on trips. Absolutely beautiful. I love the colors in the arrangement and it looks awesome in your beautiful home. Thanks. Thanks for the step-by-step instructions. It really makes a difference. And thanks to those of you that have left other suggestions; they are valuable. A girl can only dream! My husband and I are retiring to our home in Sierra Vista, AZ the high desert. How I long for the type of garden you have! The desert does have it’s own beauty and when we move here permanently the end of this month I will have a huge learning curve. You see we have owned the home for 8 years and my husband has tried to retire a couple of times but something always came up; cancer being the last thing two years ago, but now with his cancer gone the timing is right and we are going to tackle the desert! I just planted some Zinnias a couple of months ago and when we arrived last night I couldn’t wait to get the flashlight and see how they progressed. They were large and blooming but the show was even better in the morning! We have a breakout of several types of caterpillars that are everywhere and they loved the zinnias as well as the okra, the tomatoes, the grasses, and our grapes! They are literally everywhere. You are an inspiration Kevin thanks for sharing your life with us. I just have fun reading your whimsy descriptions. But serious, I do feel inspired to go try something like this on my own. I think. Kevin: Thank you for sharing all of your amazing experience with us. The end results are always fabulous. I am a great lover of zinnias and have found a variety called “cactus” zinnias that I plant from seed. They produce a smashingly delightful flower. There is a nursery in Oregon that sells seeds on eBay under the name “grocoseeds” I bought from them for quite a few years when I lived in CA and have continued to do so since moving to AR. Have had great success with them and you get a lot of bang for your buck (check out the dahlia seeds if you like dahlias – simply awesome). Phlox is underused. It is a great punch of color and fills in areas where you need something small to plug a visual gap. Kevin, it is a gorgeous arrangement. Great tutorial, Kevin! What a lovely arrangement – the how to’s are appreciated! 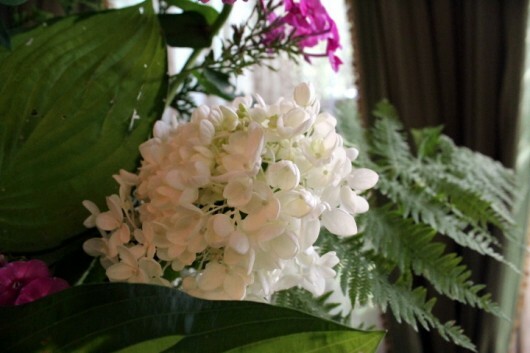 Please share your secret to keeping hydrangeas fresh in an arrangement. Mine droop almost immediately. I could not figure out what the oasis does. Do you poke the stems into it or stuff them along side of it? The bleach tip helps. Your slugs must be a lot smaller than ours–we get very large holes from slugs. It was fun watching her put together the artistic creation. What a life. Hi Dori – I should have explained Oasis better. It’s a firm floral-foam that holds many times its weight in water. Insert a stem into the foam, and that stem will remain in place. Wow what a beautiful statement this arrangement makes. 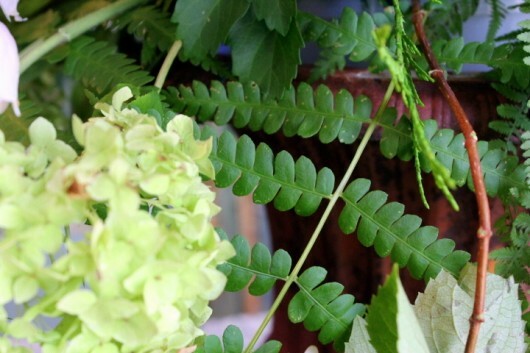 Simple cuttings from your gardens blended together into such an elegant piece of art. The tutorial was very informative. 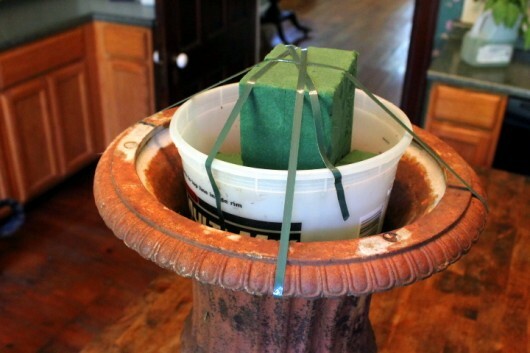 I like how you took an unconventional vase and made it work with a plastic bucket. Curious how long this arrangement lasts? Erin is a very talented floral designer, what a beautiful creation and you have great taste, the urn is the perfect choice for the arrangement in the exquisitely elegant hall. What a a visual feast. 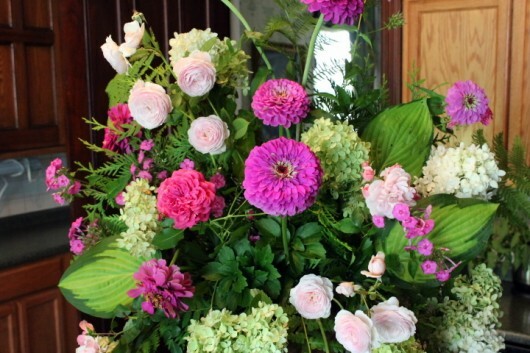 As usual you wrote an interesting and upbeat article on floral arrangement…and I thought I knew how to do it on my own. Wow, I was wrong! I love how you add humor and always make the projects seem so easy and fun. keep up the great job-it’s your calling to write this blog! To do an arrangement in shorter stems would be one of my interest since I love many flowers with shorter stems. I can see that my flower growing, and arranging, has a long way to go. Thank you for this wonderful tutorial. I’ll have to see what I can do with roses, Althea (Rose of Sharon) and Crepe Myrtle. thanks for the info. Nice! The arrangement is beautiful 🙂 I would like to know the guidelines for the ratio of flower height and width to vessel size. I feel like my arrangements tend to be too big for the vases I am using. as a retired florist I can say 1 and 1/2 the height of the container you have and approximately twice the width but this also depends ob your container. I sure do enjoy your site ! Loved it! Slugs and all!